Sage oil is acquired from evergreen perennial herb sage, scientifically known as Salvia officinalis belongs to Labiatae family. Sage herb is grow up to 60cm in height and have woody base, soft gray green oval leaves and violet or blue flowers. Sage herb is native to Southern European regions and nation surrounding Mediterranean Sea like Yugoslavia and Greece. Sage essential oil is extracted from dried leaves of herb Salvia officinalis through steam distillation. Sage oil is pale yellow-green in appearance and it triggers sensitizations. Sage oil has sharp and spicy herbal smell and it is watery in viscosity. Its main constitutes are α -pinene, camphene, β -pinene, myrcene, limonene, 1, 8-cineole, α-thujone, β-thujone, camphor, linalool, bornyl; acetate and borneol. Sage oil is well mixes with other essential oil such as bergamot, clary sage, geranium, ginger, orange, vetiver, neroli, lavender, lemon, tea tree and rosemary. 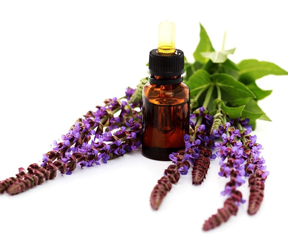 Sage oil is used for treatment of common conditions as it provide relieve in digestive issues, menstrual difficulties, fungal infections and skin problems. It encourages hair health as it is used as shampoo due to its cleansing effects and it contains beneficial properties that help address dandruff and oily hair. It moisturizes skin and used to help slows down signs of aging like wrinkles and sagging skin. It is added into skin care products like anti-mark and anti-spots which prevent cracks, scars and other unwanted marks on skin. It is beneficial for menstrual problems and activate hormones like estrogen and pain associated with rheumatism. It helps to combat female sterility, menopausal problems and has a tonic effect on urinary tract as well as liver and kidneys. It stimulates lymphatic system and boosts glandular function. It is used to ease stiff muscles and particularly fibrositis, stiff neck and eases trembling and palsy. It has laxative property, used to trigger excretion and help relieve constipation. It is used in aromatherapy as it is used to stimulate mind and help address mental fatigue and depression. Sage oil is strong and fragrant scent so it is added to soaps, colognes and perfume. It is used for the treatment of Alzheimer’s disease as it improves cognitive functioning of Alzheimer’s patients. It is used for treatment of dental conditions like gingivitis and to help maintain gum health. It helps to manage herpes, psoriasis, sinusitis, asthma, bronchitis, accumulation of phlegm, cerebral palsy and depression as it induce mental stability, alertness. As sage oil is powerful oil so it should be used with care and Sage oil has high thujone content so it can cause convulsions. Avoid use of sage oil during pregnancy or persons who suffering from epilepsy and high blood pressure. People who drink alcohol should avoid sage oil as it can heighten their intoxication. Sage oil may have side effects include inflammation of lips, lining of mouth, kidney issues, rapid heartbeat, seizures, vertigo, wheezing, tremors and vomiting.